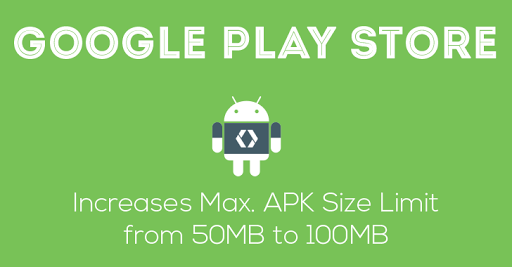 Google is doubling the maximum APK file size on the Play Store from 50 MB to 100 MB. Android app developers can now build higher quality Apps and Games that users love. Of course, for an end user it may affect the overall app performance and installation time, as well as mobile data connectivity. By increasing file size limit from 50 MB to 100 MB, Google wants to encourage developers for creating richer apps and games, as well as help avoid the need for downloading additional files after the initial APK download. However, Expansion Files are still there to help developers build apps that exceed the 100MB barrier , but the aim to increase the base limit of the APKs is to help users download and install complete larger apps in one shot. Although Google increased the size limit of apps, the company wants to make sure developers are using the increased file size limitations for the right reasons. Developers should keep in mind that the idea behind this move is not to encourage the development of bloated apps. 1. Mobile Data Connectivity – Users from countries with slow Internet connections, are not likely to download applications that will take a long time to install. 3. App Performance – Larger apps could result in lower performance, especially in older Android devices. 4. Install time – Many users give up in installing an app if it takes too long download and install. This entry was posted in Android and tagged News.